The Insurance employees are concerned about a number of issues. The prime concern is, however, regarding the pending wage-revision & the proposed move of the UPA government to increase the FDI in Insurance from 26% to 49%. NOINO has been at the forefront both in raising the wage-revision issue as well as in opposing the proposed move of increasing FDI in Insurance. The situation with respect to the wage-revision is particularly disappointing with over a year gone by without commencement of talks. With a view to break the deadlock on this issue as well as to make further efforts to oppose the proposed increase in FDI in Insurance, NOINO decided to take this issue once again with the Government as well as the bureaucracy. 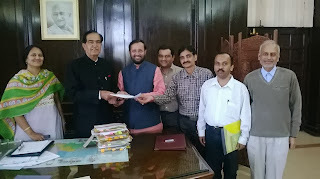 Hence a NOINO delegation led by Shri Prakash Javadekar, President, NOINO (MP, Rajya Sabha) & consisting of Dr S.B.Sharan, Working President; Smt. Anagha Sant, General Secretary; Shri Dattaraj Prabhukhanolkar, Resident Secretary; Shri Rajesh Dubey, Organizing Secretary; and Shri Ganesh Kamath, Chief Advisor camped in Delhi for this purpose. The NOINO delegation met Shri Rajeev Takru, Secretary, Financial Services, on 9.12.2013 at 9.15 a.m. for initiation of talks on wage-revision in LIC of India. We demanded immediate initiation of talks on wage revision in LIC. We informed him that NOINO had already submitted its Charter of Demands on 23rd July 2012 itself i.e. eight days before it became due. All other unions also subsequently submitted their Charter of Demands but the talks did not start yet. We pointed out that wage revision in Banks became due after that of in LIC but 3 rounds of talks already took place in Banks and the 4th one was scheduled for 14th December, whereas in LIC, it did not even start. We also pointed out that our talks were always linked with wage revision of banking industry whereas our nature of work was quite different from that of Banks. We insisted that the wage revision in our industry should be as per our (i.e. LIC) performance and it should not have any linkage with Bank. Shri Takru was very positive on these points and immediately gave instructions for preparing preliminary note for wage revision matters at the earliest. We also handed over a Memorandum to Shri Takru in this regard. The NOINO delegation met Shri Arun Jaitley, Leader of Opposition, Rajya Sabha on the same day at 12.30 p.m. We reiterated our stiff opposition to any proposed increase in FDI in Insurance. 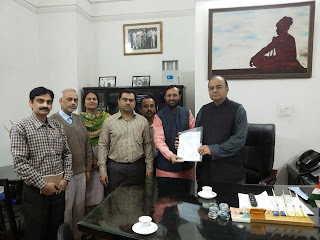 Shri Jaitley appreciated the wonderful performance of LIC & assured all support to our cause. We also submitted a memorandum to him in this regard. The NOINO delegation then met Smt Sushma Swaraj, Leader of Opposition, Lok Sabha at 12.45 p.m. We again stressed our opposition to any increase in FDI in Insurance. Smt Swaraj was very positive & said that the BJP had already told the FM that they would oppose any such move to increase FDI in Insurance. 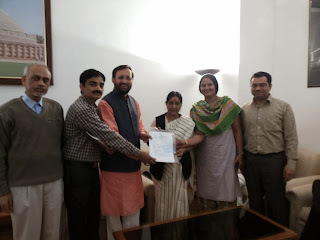 Here too, we submitted a memorandum to her. 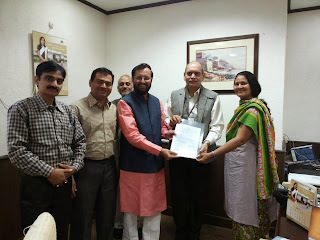 We also met Shri Ravi Shankar Prasad and other BJP MP’s in this regard. They too, assured support to our cause. The NOINO delegation then met Shri Namo Narayan Meena, Minister of Finance (State) at 1.40 p.m. We reiterated all the points as discussed in the meeting with Shri Takru such as immediate commencement of talks on wage-revision/wage-rise according to our performance over the years (& not tagging with the Banking industry etc). Shri Meena was very positive & assured that he would be talking to the LIC management immediately & would ask them to take steps to initiate the talks on wage-revision shortly. NOINO expects the talks on wage-revision to commence shortly. We also expect that the passage of the proposed Bill to increase FDI in Insurance from 26% to 49% would be difficult in the light of the opposition from the principal opposition party.